With so many pairs of golf shoes on the market how do you choose? I suppose you could say this about most shoes, the one difference being you’re using them for sport, you still want them to be stylish though and match your golfing attire. In this guide we’ll show you about all the different styles available to hopefully help narrow down your search criteria. Do I have to wear Golf Shoes? Many public courses these days will let you play without golf shoes, golf clubs are trying to encourage new people to the sport so don’t want to turn away revenue because of the wrong footwear. The upside as a customer is you can still play without the added expense of a pair of shoes, the downside is your golf won’t be as good and you may injure yourself. Most sports injuries are ankle related so you want to protect yourself as much as possible. 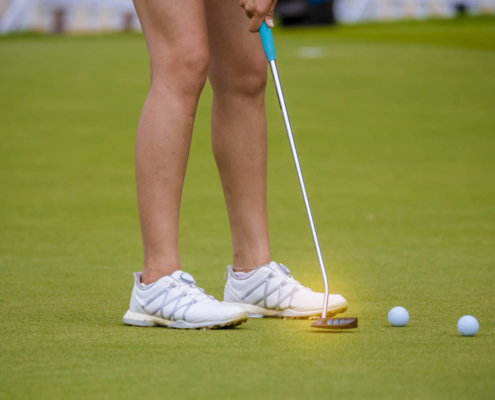 As golf is played over a varied terrain you may find yourself slipping on an uneven surface if the soles of your shoes don’t have any traction. What is the purpose of a golf shoe? Many sports use ground forces to create speed and power, golf is no different. Take sprinting, would you rather wear lightweight athletic spikes or a pair of slip on brogues. You could still run but you wouldn’t connect with the ground as well. Golf uses these ground forces in a horizontal and vertical fashion to produce rotational torque which in turn creates greater club head speed. All of this starts through the ground so it’s important to have stability through the foot to stop energy being lost. Top manufacturers spend thousands in the design process to give their shoes a cutting edge. 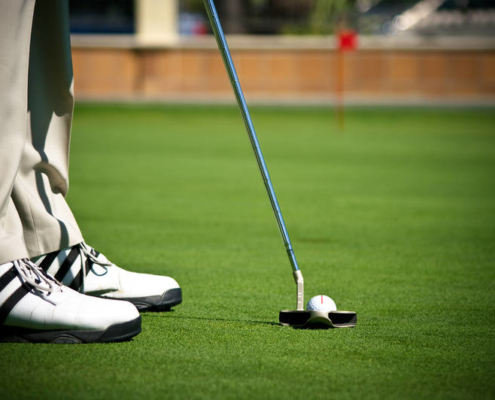 The sole of a golf shoe needs to both support and move due to the rotation of the body. This process enables a golfer to generate more power into the shot whilst maintaining stability. When you look at the price of a shoe bear this in mind. The Classic – This is a golf shoe as you’d imagine, with hardened plastic or metal spikes on the sole. The brogue is still a favourite but more modern designs with bright colours are becoming the norm. The advantage of the classic is the sturdy sole. As you rotate your body the spikes help to grip the ground allowing you to explode into your follow through with added stability. You have a much wider choice in the classic, and multiple designs to fit your style and budget. Spikeless – These shoes have come onto the scene in recent years and offer a more casual look. The sole is made up of hardened durable dimples that should outlast the natural age of the shoe. Because there are no spikes in the sole they are much lighter and more comfortable to wear and perfect for the 19th hole or on a driving range. The downside is they don’t give as much traction especially in damp conditions and longer grass. Golf Boot – These boots are great for winter conditions when the course is wet and muddy and you need ultimate stability. They have a sturdy sole with interchangeable spikes and are very waterproof. The downside is they are heavy and there is less freedom of movement around the ankle. Golf Sandal – Designed for the casual golfer playing in hot conditions. They do come with spikes but there is not much stability around the top of the foot as you can imagine. Very breathable however and perfect for those socks and sandals lovers. Leather – Leather is by far the most popular choice for golf shoes. The leather is processed and then added to the exterior of the shoe creating a stretch-free, tight-fitting shoe. Leather is perfect for summer golf due to its breathability and the saddle design stabilises the foot in the shoe. Most manufacturers will add a waterproof lining to protect you from the elements, whether that be a full on downpour or the dew on the ground from early morning play. Waterproof – Gore-tex was the original choice for waterproof linings due to its breathability. These days there are many different linings that all offer exceptional waterproof qualities as well as breathability. Most top manufacturers build their shoes with a one year waterproof guarantee, if you want something lighter and more airy for the summer then you don’t need the lining and the shoe will be subsequently cheaper. Synthetic – This non-porous polyester upper provides total waterproofness but limited breathability. They tend to be very light and a much cheaper alternative to leather. This kind of shoe will be fine to start you on your golfing journey but the lack of flexibility in the material causes it to crack quite quickly due to the excursions of the foot during a round of golf. Fittings – Most shoes offer interchangeable spikes, but be warned manufacturers use different fitting systems so its not always one size fits all. Always keep an eye for wear because any loss in traction will hinder your performance and stability when walking on uneven surfaces. Metal – Nowadays many courses won’t let you play with metal spikes due to the spikemarks and tears they leave. It will be interesting to see if they come back in fashion now you are able to repair damage on the greens under the new rule. The advantage of metal spikes is the traction they provide, you won’t fear slipping meaning you can go harder at your shot. The disadvantage is they are quite hard on the sole of the foot especially on hard ground conditions. Plastic – The softspike as it is known was borne when golf courses banned the use of metals. Made of hardened plastic they provide a wider source of traction due to their splayed leg design. The advantage of plastic spikes is they are lightweight and flex as you walk, perfect for hard conditions. The disadvantage is they wear out quickly and can get clogged up with grass in wet conditions. Spikeless – The low maintenance option and perfect for driving ranges, summer golf and the 19th hole. The hardened dimples provide adequate traction in dry conditions. The advantage of the Spikeless is they are comfortable and lightweight making them perfect for long walks on summer ground. The disadvantage is they don’t provide as much traction as a spiked shoe. With the casual golf shoe becoming more prominent laces have changed too. The traditional lace is still the most popular but there is also Velcro fastenings for ease of fitting. Another option is the mechanical fitting BOA that operates like a ski boot. These fastenings provide a secure fitting throughout the round by tightening a dial at the back of the shoe. A great option but you pay slightly more. 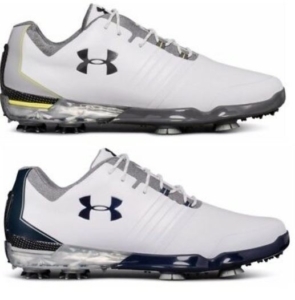 How long will a pair of golf shoes last? This will all depend on how much you play and practice and the type of course you walk around. As with all shoes they stretch over time as they mould to your foot and walking style. Typically the sole won’t wear as much as a standard shoe but due to the extreme rotational movements in the golf swing the upper will stretch quicker. If you are starting to feel a little unstable when swinging then it will be time to change. As a golf professional I personally own two pairs, a winter pair and a summer pair and these will last me a couple of years. If you play often and can afford it, buy two pairs. Your feet get sweaty when walking for long periods, having two pairs enables you to rotate them and give the others a chance to dry out. It also means you can match your shoes to your golf outfit. Use a shoe horn when putting on your shoes to protect the back of them. Always keep an eye out for the wear and tear on your spikes. You don’t have to change them all, just the ones that need replacing. Don’t leave your shoes in your car boot when you aren’t wearing them especially if you’ve been playing in the rain. Warm humid temperatures can cause the materials they’re made from to break down, decreasing their lifespan. Clean and polish after each round, a smart golfer is a happy golfer. As with all shoes you want them to fit nicely and be comfortable right from the start. This is especially important with golf shoes as you will be walking in excess of 4 miles each round you play. The walking over varied terrain and hitting shots puts a lot of pressure on the foot and shoe. With this in mind if you are a regular golfer don’t buy cheap ill-fitting shoes as it will do you more harm than good. At the top of your shoe, where your laces tie, there should be a space about a thumb’s width wide. As you walk the shoes will start to stretch so you’ll need to tighten them halfway through a round. There should be approximately half an inch between your longest toe and the end of your golf shoe. There should be no excess movement in your shoes when you walk. When simulating your golf swing in a new pair of shoes, they shouldn’t feel too loose or too tight. Some manufacturers like Footjoy also offer different widths so also bear this in mind. Too narrow and your toes will rub, too wide and you’ll have excess movement both will give you blisters. I would highly recommend buying a pair of golf shoes that have been reviewed well by others. Amazon has a great selection of golf shoes and usually have great returns policies. You may have your eye on the latest fancy coloured model but depending on the shape of your foot they may not suit you. At least by visiting a retailer you will be able to try various models and find something that is perfect for your needs. If you’re buying online to save a few pennies make sure you’ve tried them on somewhere first. Footjoy – With an array of choices to cater for all players and all budgets Footjoy is my #1 choice. Their company motto. “FootJoy. It’s about comfort. It’s about performance. It’s about tradition. FootJoy has been committed to creating superior golf footwear, gloves, and accessories that will enhance your on-course experience. Adidas – As you’d expect from one of the world’s leading sportswear companies, Adidas produces quality golf shoes for all budgets. All of their shoes are of a lightweight design and they have styles to suit every player. Ecco – At the higher end of the price bracket Ecco shoes are designed for comfort as well as stability. “Founder Karl Toosbuy wanted to make shoes that did not need to be broken in. They should fit like a glove straight out of the box. That became the beginning of ECCO’s revolutionary philosophy: to create shoes that were comfortable, lasted longer and enabled people to move naturally.